Consult our Dark Dimensions City of Ash Walkthrough when things go from bad to worse in the soot-filled town of Phoenix Hill, CA. Explore this latest Dark Dimension with confidence using our custom screenshots, detailed instructions, and puzzle solutions as your guide, knowing that your presence has sparked the ire of the looming volcano, and the earth has begun to rumble in barely contained anger. Can you track down the source of this outrage and close this Dark Dimension before it's too late? You can, with our Dark Dimension Walkthrough at your side! 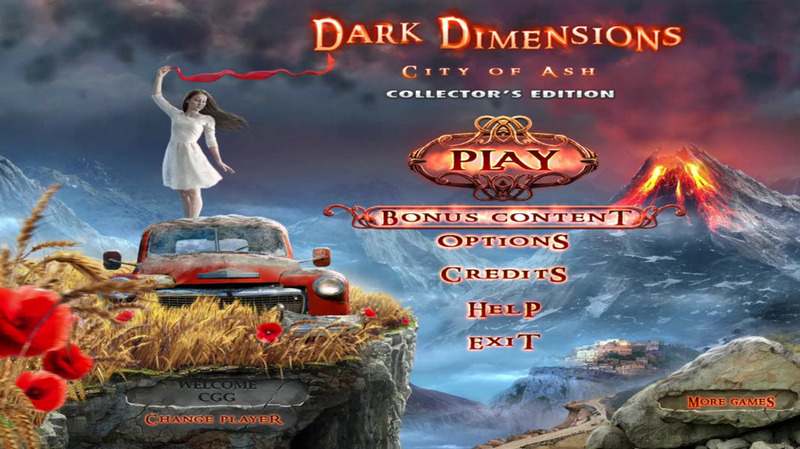 Welcome to our Dark Dimensions City of Ash Walkthrough, where you'll discover everything you'll need to know to play this exciting hidden object adventure game. We've made sure to include detailed chapter-by-chapter instructions, tons of custom screenshots, clearly marked so you can see exactly where key items are located, as well as simple solutions to the puzzles and mini-games you'll encounter in this fiery mining town. We hope you enjoy our Dark Dimensions Walkthrough! In Dark Dimensions City of Ash, you've tracked down another Dark Dimension phenomenon to a small mining town in Phoenix Hill, CA. The town was once a bustling point of commerce, but was obliterated by a fiery volcanic eruption. Now, the former residents are trapped as spirits of fire and ash, unable to move on, caught by some unknown force holding them hostage. Now, it's up to you to unearth the truth about what happened in this once prosperous town that caused a Dark Dimension to appear. But, you must hurry... the ground had begun to tremble once more and the volcano may erupt again at any second! Can you discover what lurks at the heart of this small town before it's too late? With our trusty Dark Dimensions City of Ash Walkthrough at your side, it won't be a problem! Difficulty - Three modes: Casual, Advanced, and Hard. In Casual Mode, active areas will sparkle, hint and skip buttons charge quickly, and there is no penalty for mis-clicks. In Advanced Mode, there are no active area sparkles, hint and skip buttons charge at a slower rate, and there is a penalty for mis-clicks. In Hard Mode, there are no active sparkles, no hint or skip buttons, and a penalty for mis-clicks. Hand - When your cursor turns into a hand, it means you can pick up an object and place it in your inventory or interact with it in some way. Gears - When your cursor turns into gears, it means you can use an item from your inventory in that location. Journal - Your Dark Dimensions journal can be found in the lower left hand corner of your screen. Game notes and observations that you make throughout the adventure can be found here. Inventory - Your inventory can be found at the bottom of your screen. Hover your mouse over it to bring it up. Click the padlock in the right corner of the bar to lock it in place. Hidden Object Scenes - Hidden object scenes will sparkle. Find the images on your list throughout the scene. Items in yellow require an extra step. Mini-games - During mini-games, if you can't figure out the puzzle or don't feel like trying to solve it, you can click the skip button to skip the puzzle and move on. Map - The map is located in the bottom left hand corner of your screen. Click on it to open it and then you can click on any open location to fast travel to it. And those are the basics for playing Dark Dimensions City of Ash. We wish you good luck and hope you enjoy our Dark Dimensions Walkthrough!